How many of us have some old CDs in our homes which we do not know what to do with. Throwing them is not a good idea because with a little imagination we can make many decorative items for our homes and it's very useful to care of our environment. Curtain: This idea is very simple and quite decorative. We need a lot of cds depending on the height and width you want. With the help of a hot needle make a hole in the top and bottom of the CD and let a line joining each CD making a knot until we have the required length.We tied the first strip to a tube or stick of bamboo curtain. We do the same procedure as necessary to achieve the desired width of the curtain. Decorative pannel: Using acrylic paint can make different patterns on the CDs, it can also play with other materials such as frost, ribbons, buttons, etc.. Crystal Ball: A nice accessory that we have in our home, where reflected sunlight or during a holiday or at Christmas, is the crystal ball. We need a styrofoam ball the size you want and many CDs cut into small bits. At the top of the ball we put a small ring then we will be able to hang it on the ceiling. Then we started using silicone to glue each piece of CD to complete our ball !. 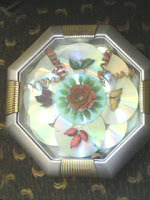 As you see, there are many ideas we have to reuse old CDs, just a matter of putting our imagination and creativity. This Is My New Crochet Hot-pads. A Crochet Rug With Pattern. 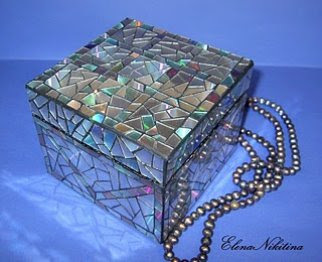 Do you have an old mirror?? Don't throw it. Decorate your wall with cardboard. How Can You Make Candles At Home? What A Beautiful Beaded Watches !! How to make paper pulp .